Anything Moroccan just sound exotic and scrumptious right? Well, here I have to be honest. I’ve never had authentic Moroccan food, and I wouldn’t even know where to get it if I wanted it. But I found a Moroccan spice blend on epicurious and knew right away that I’d love the flavors. Cumin, cinnamon, paprika, ginger, cayenne and coriander all mixed together in just the right proportions. I made the spice blend, skewered some chicken and sweet Vidalia onion onto kebabs and rubbed it all over with olive oil, salt and pepper and the spices. Is there anything better than meat on a stick? I love that kebabs are easy to grill, easy to portion and look great. Once these came off the grill, I topped them with chopped olives. The kebabs were juicy, spicy and aromatic, and the olives were a perfect briny contrast to the seasoned chicken. I’m glad I stumbled on this spice mix because I know these kebabs are going to be around all summer long. Say hello to grilling season! Mix your spices together in a small bowl or jar until well combined. Set aside. 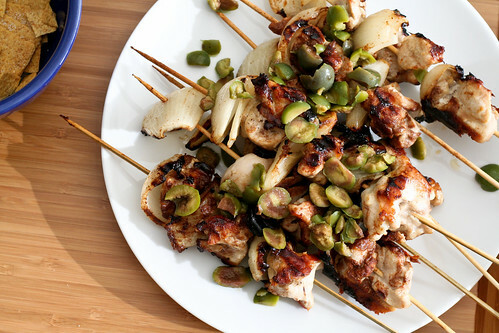 Make your kebabs by skewering the chicken and onion, alternating as you go. Brush the skewers with olive oil, then sprinkle evenly with salt and pepper. Evenly sprinkle all sides of the kebabs with the spice mix, then place them on the grill for about 5 minutes on each side, or until the chicken is cooked through and browned on the outside. Transfer the kebabs to a plate and top with the chopped olives. Lovely photo and the recipe sounds great. I love Moroccan flavors too! My husband picked this out from Tastespotting to make tonight. It was really excellent! We put the spices on chicken and veggie kebabs, served with an almond-raisin couscous and harissa yogurt on the side. I think we’ll make a bunch of the spice mix to have at the ready. Thank you so much for sharing!! I THINK YOU’RE MY HERO I’ve been searching all over the internet for days and finally the last day before my Culinary Project I find a recipe worthy for the job! The prep/cook time is great and the ingredients are fairly easy to find. I hope my teacher accepts the recipe so I can start practicing this mouth watering meal!